About 2 years ago, we finally decided to turn off our cable television account, return our cable boxes and rely on over-the-air broadcasts again. While the thought of living with "rabbit ears" didn't really thrill me, we were only watching about 5 shows from broadcast TV. Joseph had long outgrown NickJr and Nickelodeon -- his major viewing. We didn't subscribe to any pay channels and looking over the all the channels we COULD watch, we only really would ever watch about 10 of them. So, once the cable bill topped over $100 it was time to turn it off. First, we needed a decent antenna to receive the HD over-the-air (OTA) digital broadcasts. Too many people think that when we turned off the analog broadcasting system a few years ago it turned off ALL over-the-air broadcasts. In fact, there is more content to be found, for free, over-the-air than ever before. Looking about in the Internet, I came across the Mohu Leaf indoors HDTV antenna. it took a little fiddling with positioning in our large home office/family room, but now we can watch any broadcast television show we might wish, including Castle, NCIS, Big Bang Theory and Once Upon A Time -- which are basically all we watch. This also pulls in news during fires, earthquakes and other emergencies. This antenna is connected to a 42" LCD HDTV that we upgraded to a year or so ago and provides full 1080p signal for most stations and shows. By going Internet-only we cut our costs to around $55/month with no extra taxes, fees, etc that cable television subscriptions can incur. I purchased my own cable modem, which saved the monthly rental fee, too. Joseph had already assisted in moving a lot of my entertainment viewing over to YouTube, where I watch many of the same game-related channels as he does, along with a smattering of BBC, nature, gardening and cooking shows. My typical viewing day is made up of probably 80-90% YouTube viewing. A few months ago, we added a Netflix account, but I must say that we revisit this every month. There isn't much selection for my own tastes, although we are currently using it to rematch old television shows in their entirety. This would probably be the first thing we would cut, if we needed to save some money. Despite the quality of the exclusive Netflix content, like House of Cards, these shows are not something I enjoy watching, so there isn't a lot of benefit for me there. 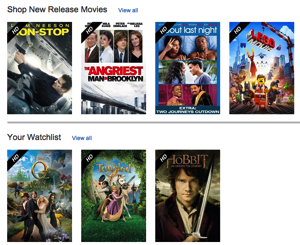 If we want to "rent" a newer movie, we usually turn to Amazon Instant Video. We can access this via our computers or via a Bluray/Smart TV box that was gifted to us. This gives us full HD 1080p quality directly to the big screen including Pause/Play and FF/RW controls, should we wish. Average rental for an HD film is around $5. We can also rent and buy from the Apple iTunes Store, should we wish. If a particular podcast isn't available on YouTube, too, I can download them using iTunes and then present them on the HDTV. I have connected the HDMI port on my Mac Mini directly to the television for the highest quality. I subscribe to a wide variety of podcasts including audio-only, gardening, history, technology and more. You can easily browse and search the iTunes podcast directory for both audio and video shows that match your interests. Our friend, Liam, was nice enough to gift us a Google Chromecast -- which is a streaming video dongle that plugs directly into the HDMI post on our TV. Using the Chromecast, we can send video from YouTube, Netflix, Hulu Plus, Vevo and more directly to the television, as well as music, photos and even our computer screens. This has quickly become our "go to" device for watching content, as it is so easy to use. Rosanne is not a technophile. She just wants things to work. The biggest praise I can give the Chromecast is that Rosanne was willing and able to select a show from Netflix on her iPad and send to to the HDTV for viewing. This shows how simple it can be and how useful it can be for all family members. Overall, we have been very happy with our decision. it is rare that we haven't been able to view a show we really wanted to see. If necessary, we can even fall back on renting television shows if it is really important, but we have found that this hasn't been the case in reality. We probably watch as much "television" as we were watching before (which wasn't that much even with cable TV), but now we watch on our schedule and use YouTube, Netflix, iTunes and other sites to let us view what we want, when we want it instead of just having the television on in as noise in the background. In most cases, I run photo slide shows on the TV, if we aren't actively watching something else. If your cable bill is getting higher and higher, while your enjoyment of TV is getting less and less, you might want to consider "cutting the cord", even in some small way, and see how it works for you.